MK Basel Ghattas submits plea to Vatican to stem rise in Christian Arab recruitment to IDF before upcoming visit. MK Basel Ghattas (Balad) appealed to Pope Francis Wednesday, asking him to personally intervene to stop Christian Arabs from recruiting into the IDF, according to Ha'aretz. Ghattas submitted the request to Archbishop Giuseppe Lazzarotto, the Vatican's representative in Jerusalem, at the Holy See's office on the Mount of Olives. The MK linked the timing of the request with the Pope's upcoming visit to Israel, scheduled for May 24, 2014. 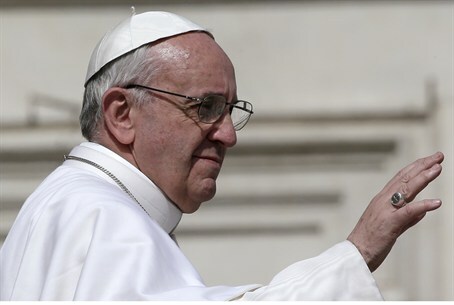 Rumors circulated earlier this month that the Pope's visit will be marked by a show of support for the Palestinian Arabs. The request was made just one week after the Forum of Christian IDF soldiers revealed that Christian Arab recruitment is on the rise. The IDF does not provide precise numbers of Christians serving in its ranks, but the forum says the increase is significant and that there are currently 300 Christians serving in the IDF, 157 of them in the conscript army. Ghattas's letter is yet another step in the campaign that Arab leaders have been building against the rising recruitment. The Forum's leader, Father Gabriel Nadaf, has advocated for a strong connection among Arab Christians with the State of Israel but has been sanctioned by the official Greek Orthodox church over his views. MKs from Israel's Arab parties - all of which are staunchly anti-Zionist - have also condemned him, calling him "an agent of Zionism who seeks to divide Arabs". Attacks on Nadaf intensified in December, when his 17-year-old son was violently attacked in Nazareth. The attacker was identified as an activist from the extreme-left Hadash party. MK Hanin Zoabi (Balad) has also stepped up attacks against the Christian Arab recruitment efforts. Last week, she was accused of threatening the Forum's spokesman, Sha'adi Halul, over the draft issue. The rise in Christian recruitment has been attributed to a number of factors, most notably the contrast between Israel's treatment of its Christian minority and the widespread persecution and killings of Christians in surrounding Muslim-majority countries. In particular, ancient, pre-Islamic Christian communities in Syria, Egypt and Iraq face widespread attacks by Islamist groups, and some have suggested that harsh reality has driven many Christian Arabs in Israel to reconsider their traditional alignment with the Muslim Arab anti-Zionist leadership. Just yesterday six members of a Christian family of Syrian origin were murdered in the Egyptian city of Alexandria. Iraq's Christian community in particular faces extinction, having plummeted from over one million to just 400,000 due to a campaign of attacks by Al Qaeda and other extremist groups. Monsignor Pios Cacha of Baghdad's St. Joseph church last year expressed his fear that Iraqi Christians might end up "follow[ing] in the steps of our Jewish brothers", referring to Iraq's once-thriving Jewish community that was all but wiped-out due to persecution, discrimination and violence at the hands of the country's Muslim majority. In contrast, Israel is the only Middle Eastern country whose Christian population is actually growing in number.